I love pancakes. Growing up, my mom would often make large batches of pancakes (or waffles) for the houseful of kids who were inevitably around on the weekends. 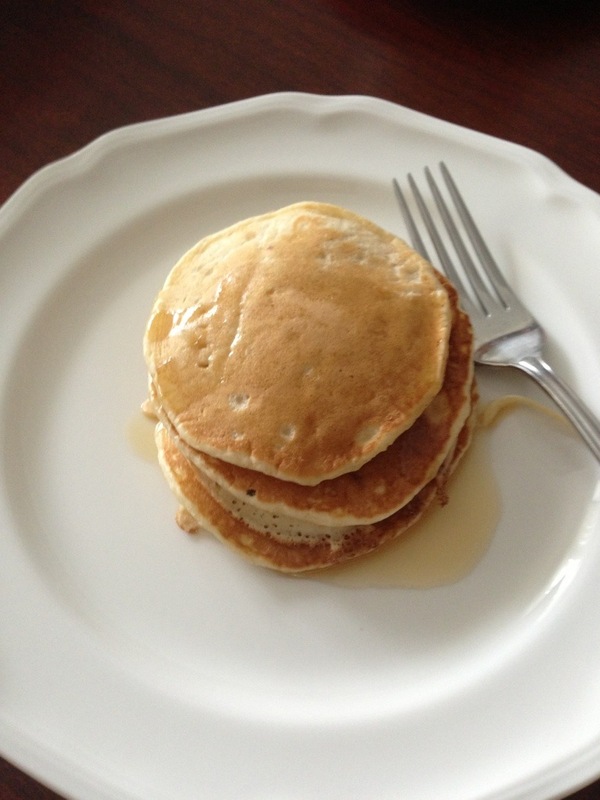 American pancakes are thicker and fluffier than the pancakes served in many other countries. Using Bisquick makes everything very easy, but as we have none here, I set about finding/creating the best recipe I could that was made from scratch (and that was not a recipe for buttermilk pancakes, my mom’s specialty — no buttermilk here and I’m usually in too much of a hurry to let milk and lemon juice sit ahead of time). Popular pancake additions, added just before the bubbles form, include: blueberries, banana slices, and chocolate chips — or a combination thereof. Blueberry pancakes are my absolute favorite, and I even froze blueberries just so I could have blueberry pancakes year-round here. As a result, we’ve been having many more pancake mornings than ever before. Sometimes we even have the childhood favorite breakfast-for-dinner and eat pancakes for dinner! It does help that we still have maple syrup to pour on top (and for those in Belgrade looking for maple syrup, we have seen it at both Mercator and Idea). No maple syrup in sight? No problem: you can make your own by boiling water, brown sugar, and white sugar until the sugar dissolves and the liquid thickens. In a medium-sized bowl, mix together the flour, baking powder, sugar, and salt. In another bowl, mix together the milk, eggs, and vanilla. Add to the dry ingredients, stirring until just blended (batter will be slightly lumpy). Stir in the melted butter, adding more milk if needed to obtain desired consistency. On a hot, nonstick griddle or frying pan, pour roughly 1/4 C batter per pancake. Flip when bubbles begin to appear. Best enjoyed with maple syrup!